Counting the number of places to exhibit my art is like counting my blessings. All of a sudden my calendar is full. I’m excited to share my summer “fine art tour” of fresh, new work with you. If you have never viewed my paintings in person, this season offers multiple venues. Mark you calendar. My “tour” starts this afternoon, just in time for Mothers Day! “Kalo Collage,” 15″ x 30″ hand-dyed paper on canvas. “Collages & A Bit of Clay at Ho‘omaluhia.” A jewel-like showcase of collages and fine craft items. 2D and 3D works by sister artists Joy Ritchey, Dorothy Brennan, Hiroko Shoultz, Barbara Guidage, Susan Rogers-Aregger (who wrote the book on paper dyeing and collage), and me! These are my two very first collages and the most recently completed art pieces of mine. At the Visitor Center Lecture Room at Ho‘omaluhia Botanical Garden, end of Luluku Road, Kaneohe, Oahu. Daily through June 30, 2014, 9 a.m. to 3:30 p.m. Free admission. The items may be purchased off-site by making arrangements with Susan, phone 808 395-4702, email sraoahu@hawaii.rr.com. “Hydrangea Collage,” 30″ x 15″ hand-dyed paper on canvas. Sold. “The MAMo: Maoli Arts Month Silent Auction.” A bonus opportunity for attendees of the MAMo Wearable Art Show at the Hawaii Theatre, downtown Honolulu, up in the Weyand Room, Wednesday, May 21, 2014. Please contact the theater box office for more information about the evening fashion show. “The MAMo Native Hawaiian Arts Market.” Native Hawaiian artists and craftsmen wrap up Maoli Arts Month at the Bishop Museum, May 24 and 25, 9 a.m to 5 p.m. Entrance on Bernice Street in Honolulu. I will bring to market my inventory of original oil paintings and selected giclée reproductions. This is a chance to meet many other Native Hawaiian artists, watch some demonstrations, and support their work. $5 reduced price of admission for kamaaina (Hawaii residents) and military with valid ID gets you in to the market and all museum exhibits. This is a deal! “Ko‘olauloa Hawaiian Civic Club Diamond Emerald Anniversary.” Brunch, Hawaiian music entertainment, and silent auction. Turtle Bay Resort, Kuilima, Oahu, June 14, 11 a.m. to 2 p.m. 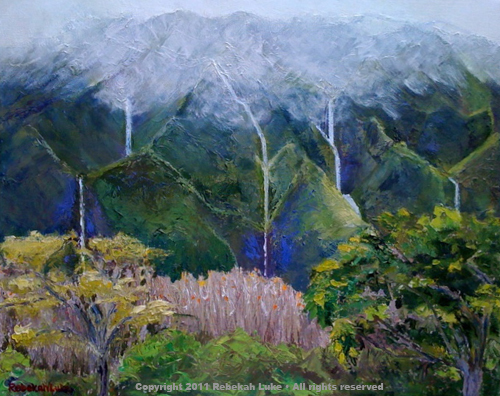 I am placing two landscape paintings–one of Ko‘olauloa and one of Ko‘olaupoko—into the silent auction. Individual tickets to the 90th anniversary party are $100 per person. Please contact president Ululani Beirne, 808 237-8856, or Francine Palama, 808 341-9881, for tickets. Beginning Oil Painting Lessons by Rebekah Luke. 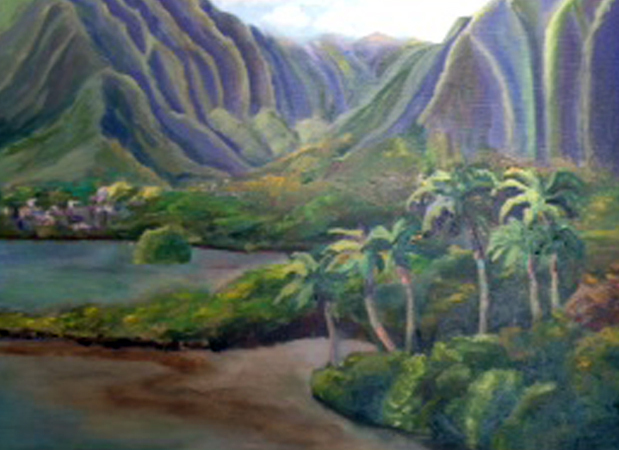 I have scheduled my Painting I course for adults starting June 21, and extending through Oct. 25, 2014, at my physical studio in Kaaawa, Oahu. Twelve sessions on selected Saturdays, 10 a.m. to 3 p.m. Lessons generally follow those taught by the late colorist Gloria Foss. Tuition is $300. Cost of materials and supplies is additional. Those who have this on their bucket list, please email rebekahluke@hawaii.rr.com for complete details. “Pacific Cup Craft Fair.” Come visit my booth at this event held in conjunction with the Pacific Cup yacht race from San Francisco to Kaneohe. Kaneohe Yacht Club, 44-503 Kaneohe Bay Drive, Kaneohe, Oahu, July 25, 9 a.m. to 2 p.m. Images of beautiful Kaneohe Bay. 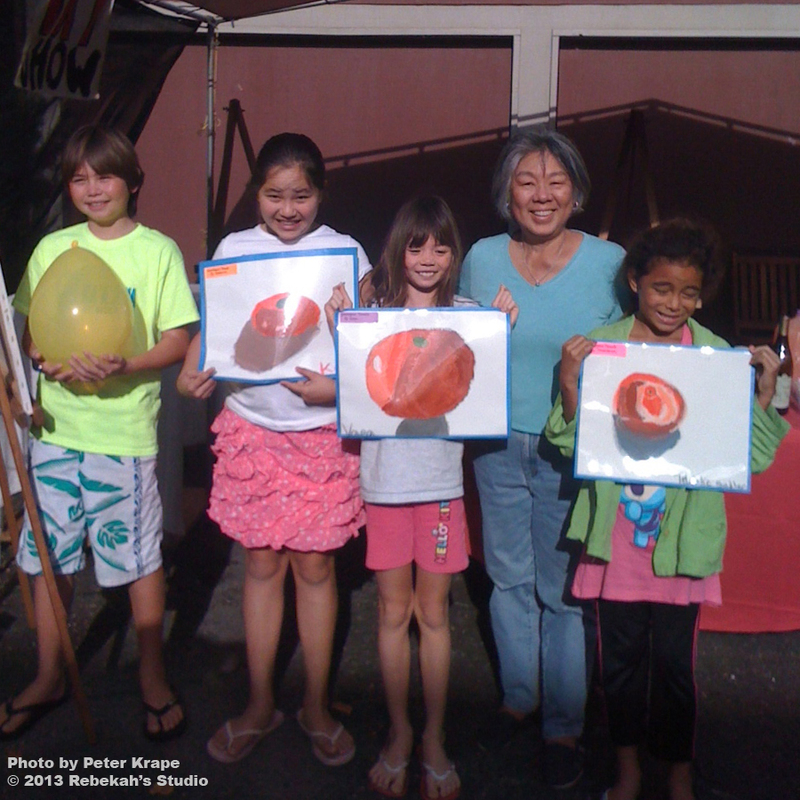 Here, showing off their “Analogous Tomatoes” at this morning’s art show, are my 8- and 10-year old pupils from the neighborhood. Bright and early at 8 a.m. they came with their families, friends, and refreshments to share what they did for the past six Saturday mornings at the studio. Everyone pronounced it a success. There were requests for another round of classes. Of course, the boy on the left is not holding a tomato. It is a balloon, that is a type of ball or sphere and his 3-D choice for the BCCC (ball, cube, cylinder, cone) lesson. The tomatoes are analogous because to model their form they are painted with colors that are analogous on the color wheel. I teach the “Tomato Theory” so called by my late fine art teacher and oil painter Gloria Foss. To warm and lighten a bright red tomato, we use red-orange and just a little bit of white. To darken the red, we move in the opposite direction on the color wheel to a red-violet. This method makes the object appear most vibrant and is preferable to darkening a hue by adding black or the complementary color. 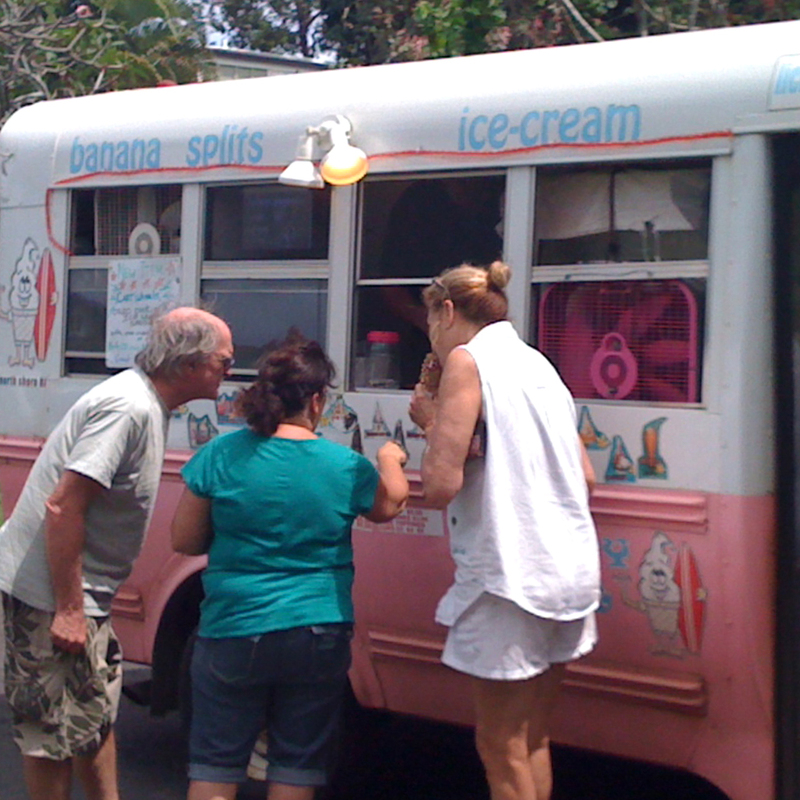 The ice cream truck came later in the day during my Painting I class for adults, just in time for lunch. Dessert first! 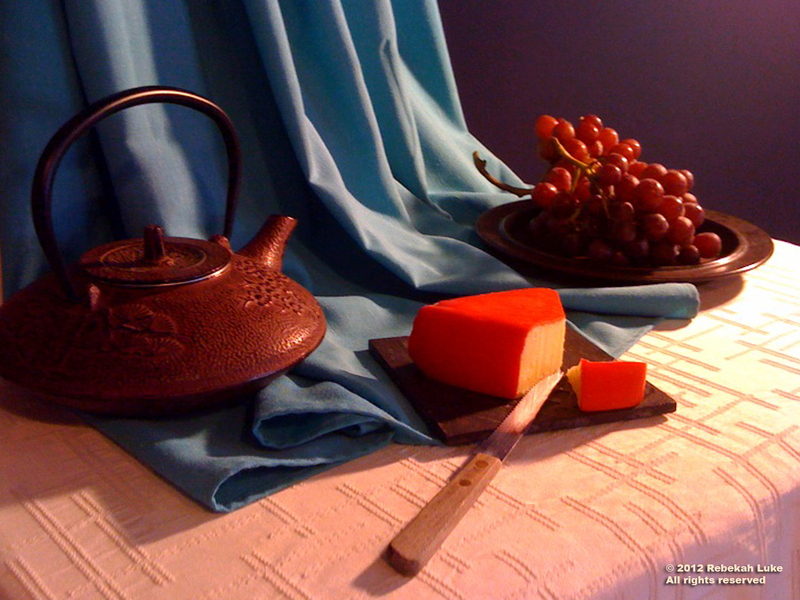 Grapes and drapes still life setup, Painting II, Rebekah Luke, instructor. 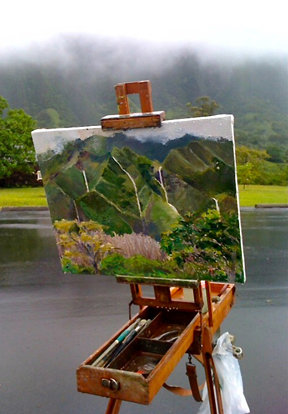 Today my Painting II class is painting “Grapes and Drapes.” This lesson, originally from Gloria Foss, is practice in the studio for painting the Ko‘olau Mountains and trees in the landscape later on. We pay attention to where the light is coming from in the scene and turn the form with values from light to dark. “Tomato Theory” can be a hard to get used to at first, but practicing it makes objects pop with vibrance and gives the overall painting more pizazz. I find it satisfying to be able to pass on the techniques I learned from my own teachers Vicky Kula and Gloria Foss. What they taught me and what I am passing on to my students is the logic of light. My teaching début went well today, the first of a series of 12 classes in oil painting. I hope the response the first Reiki class I’m offering with my colleague Lori on the 18th will be as good. 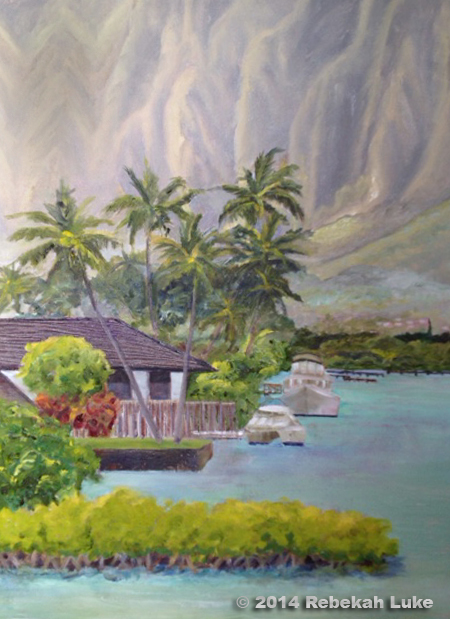 I have three enthusiastic painting students who will come to the studio once a week from Honolulu on the other side of the island to learn the fundamentals of how to paint. Today, after the introduction of the Ball, Cube, Cylinder and Cone—the four basic forms—we used this tabletop set to practice drawing ellipses. Ellipses form the front and inside back walls of the roundish objects. Correctly drawn ellipses for objects with a circular base, such as the pitcher—ball-like at the bottom and cylindrical at the top, and the black vase—a combination of a cylinder and a ball at the bottom and an upside down cone at the top, is the first step in translating the volume of three-dimensional objects to the two-dimensional drawing surface. The butter dish is designed with an open cylinder for a handle. The cover is a variation of the cube, in that there are three planes showing. 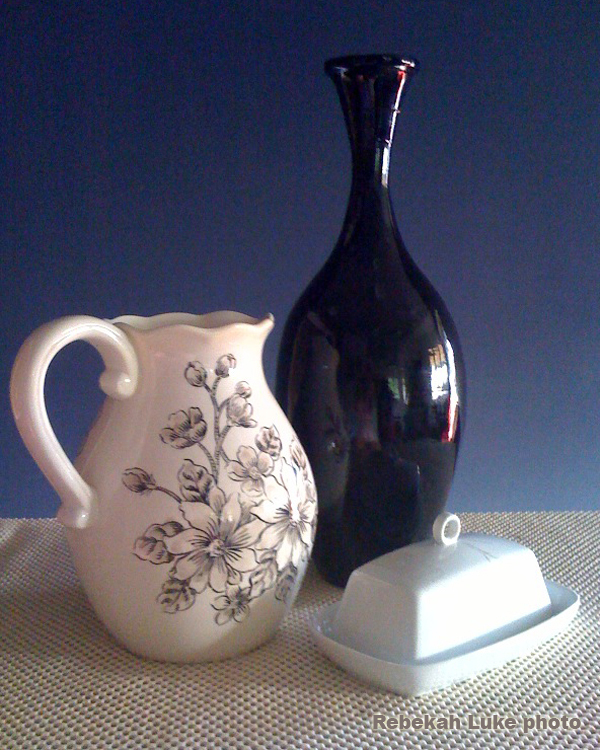 In the photo, the longer plane of the butter dish is too “hot” from the bright morning sunlight hitting the surface straight on, coming in through a window reflected in the black vase. If I painted it, I would make it a lower value (a little darker, such as a pearly gray) but not as dark as the neighboring plane. I could/should have “burned in” that part of the photo before publishing it for a better image. I thank my own teachers Vicky Kula and the late Gloria Foss, whose How to Paint curriculum is the basis of my teaching. Is painting on your bucket list? Painting is on my friends’ bucket lists. They’ve inspired me to teach some fundamentals and techniques and offer a course. 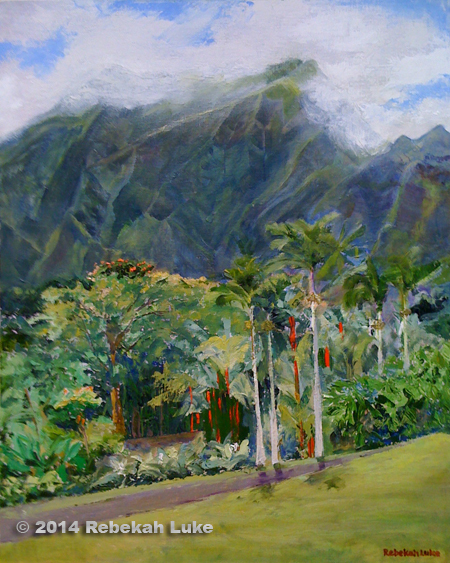 As promised, I will open my Kaaawa studio for Oil Painting Lessons starting February 2012. Registration is open now and enrollment is limited. The “Painting I” course consists of 12 weekly lessons on Wednesday from February 1 to April 25. Class sessions will be from 10 a.m. to 3 p.m. and include a lunch break. Tuition is $100 a month. Cost of materials is additional. I just noticed it’s leap year, so you’ll either get a bonus or won’t have to feel bad if you miss one class. Students will learn impressionistic painting in oil. Lessons will generally follow those taught by the late colorist Gloria Foss, my oil painting teacher, and as found in Foss’s guidebook How to Paint. I’ll add my own experience as a fine art painter and photographer to show you what to do. I’ll teach you art fundamentals and the logic of light to give you a solid foundation to pursue painting as an avocation or a vocation. Each lesson will consist of a brief lecture on art theory, a demonstration, hands-on still life drawing and painting in the studio, homework, and critique. Each week we will build on the previous technique learned, and eventually we will apply what we have learned in the studio to the landscape. I first met Gloria Foss at the Honolulu Branch of the National League of American Pen Women where she was an Arts member and I was a new Letters member. She was a UH Mānoa student getting her Master of Fine Arts degree. She wanted to teach. She said if all of her art teachers had explained some things from the very start, it would have been a lot easier. She was about 60. Teaching was on Gloria’s bucket list! After I finished the black-and-white photography curricula at Art Center College of Design in Pasadena (I didn’t complete color photography), I sought a studio class to keep my eyes trained. 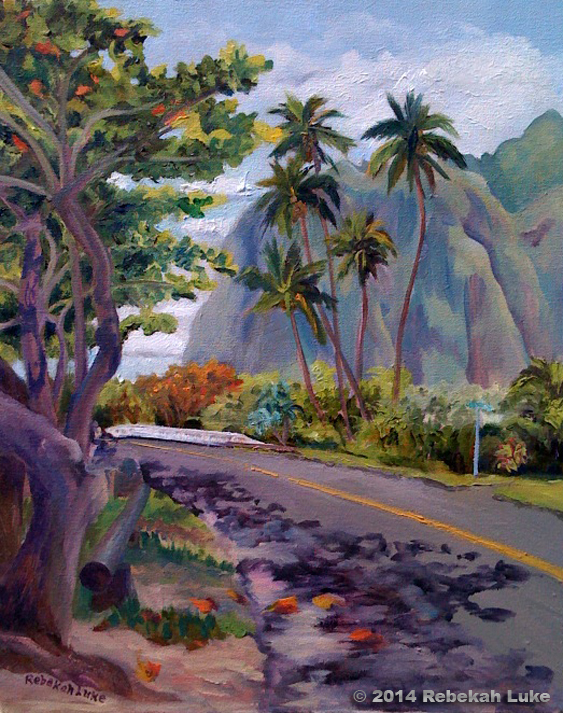 By then Gloria had designed her own “Gloria Foss Color Course” and opened the Foss School of Fine Arts in Honolulu. Then I had the honor and delight of making the photographs of the studio lessons in her book How to Paint. It’s now my desire to share what I learned, then and since, with others. Your investment will be the cost of tuition—$100 a month for each of three months for a total of $300—plus the cost of materials and supplies. When you register, you will receive a complete list of art materials to buy. For the first two or three lessons, you will not need everything on the list. All items on the list will cost an estimate of $125-$150. Easels will be provided for class use. An optional text is How to Paint by Gloria Foss (New York: Watson-Guptill Publications, 1991) that will be used for reference. It is out of print, but you can try to locate a used copy. Information on how to obtain a CD of the book will be given in class. To reserve your place in class, send your correct name, mailing address with ZIP, phone number, and email address with a minimum $40 deposit to Rebekah Luke, P.O. Box 574, Kaaawa, HI 96730. Or, include the information in an email message to rebekahluke@hawaii.rr.com and send your deposit via PayPal with the DONATE button in the right sidebar. After your deposit is accepted I will send you a supplies list and information on where to go in Kaaawa for the first class. Happy painting! The average person spends the end of the year trying to tie up loose ends, I think, and for me they have to do with seeds some of my friends planted in my brain this week, between Christmas and New Year’s. What I mean is, each expressed an interest in something I have first-hand knowledge about, and I feel I should get back to them. But why not share it with visitors to the Rebekah’s Studio too? One is a recipe, the next is a travel tip, and last is someone’s bucket-list item. For my hanai brother Brian, here’s “Oven Kalua Turkey” from A Hundred Years of Island Cooking by Hawaiian Electric Co. Valerie, a sister member of Hale Kūʻai Cooperative some years ago, gave it to me. During the holidays she always has this on hand for guests, she said. I made it for Christmas Day (omitting the banana leaf because I didn’t have one) and Mom served it alongside a ham. I bought a frozen turkey and started thawing it in the refrigerator four days before cooking it. After Julia Child, I used butter. Rinse and drain turkey. Line a large baking pan with foil. Wash ti leaves and banana leaf; remove fibrous part of the veins. Line baking pan with ti leaves radiating from center; place half of the banana leaf in bottom of pan. Place turkey on leaves. Rub remaining ingredients on inside and outside of turkey. Place remaining half of banana leaf over turkey; fold leaves around turkey. Crimp foil around turkey and cover pan lightly with additional foil. Roast in electric oven at 375 degrees Fahrenheit for 6 hours. Shred turkey, adding enough of the pan liquid to moisten meat. Makes 8 to 10 servings. For my Kaaawa neighbor Ted, who is more senior than I and who is curious about ship travel because as a member of his family has airline privileges he and his wife Dorothy have always flown, I highly recommend river cruising, and here’s the web link: http://vikingrivercruises.com. Go ahead, click on it. With the money you have saved on airfare, you can afford being pampered. I booked a Viking River Cruise for DH and me on a whim when I quit my last job, and the trip became our 25th anniversary present to ourselves. I thought I’d better do it while I still had money in the bank. It was our first real cruise — the kind where you unpack just once — and we loved it. We rode on the Danube River on a 150-passenger longship across Austria in the December snow, stopping at the river towns and traditional Christmas markets between Germany and Hungary. Unlike us, you don’t have to go in winter. For my alumni glee club sister Linda, who is newly retired from 9-to-5 and has painting on her bucket list, here’s a big announcement: I’ve decided to give formal lessons in how to paint, starting February, to you and a small group at my studio, following my teacher the late colorist Gloria Foss. Yes! 😉 Before I change my mind, I’m posting it here! Registration will open soon. Linda kept whispering painting questions to me between songs in rehearsal every week, so I figured she’s serious. “I can teach you that,” I said. Teaching a course in painting will be a first for me. I’m not sure what took me so long to take this step in my journey, but I’m excited! Mahalo, Linda, for inspiring me to share what I’ve learned. As an oil painter I’m often asked, “How long does it take to finish a painting?” In the same vein artists will remind each other, “You have to know when to stop.” We like to avoid overworking a piece. My “Clouds Lifting Over Lanihuli” demonstrates these points. First is a photo of the painting mid-way, in the field. On a clear day, there are no waterfalls in the scene, but just after a big rain when the clouds lift, there they are! To paint en plein air I headed to this place to study the scene when it was raining, time after time. I took this snapshot from the trunk of my hatchback where I’d taken shelter. I wanted so much to finish the painting. Below is what I published, i.e., what I thought was ready for market, a few weeks ago. Oils take a long time to dry—up to six months before they can be varnished. In the meantime I can look at a painting every day. As I kept staring at this piece (it’s staged above the TV cabinet) something bothered me. It wasn’t finished. I decided to correct the areas of the painting that were “wrong.” In a representative piece, although it is impressionistic (I label my style as “impressionistic representationalism”) I want to paint a scene so that it looks logical. 1) I added pigment to the center clouds area to hide the waterfall behind it. 2) I widened the same center waterfall at the bottom because it is closer to the viewer (and so should appear larger). 3) In addition, by very very carefully scraping with the long edge of a palette knife, I knocked down some objectionable relief areas I originally painted of the mountain ridges at the top and touched up the clouds to make them softer and smoother looking. 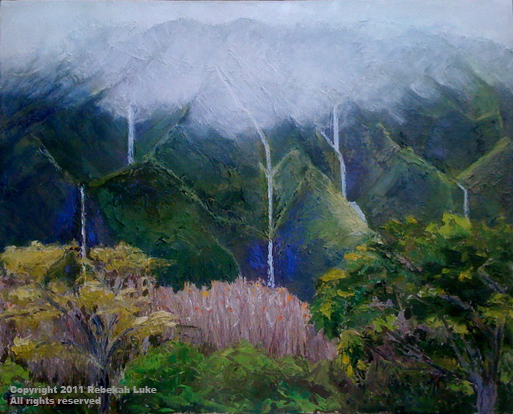 “Clouds Lifting Over Lanihuli” looks better now. I hope you agree!